Your baby will spend a lot of time sleeping during the beginning of his life, but there may be times when you have difficulty getting him to fall asleep and stay asleep at night. During the first three months, your baby needs around 16 hours of sleep and by 12 months, should be sleeping about 14 hours, according to the BabyCenter website. If sleep isn't coming easily for your baby, some simple techniques and natural remedies may help. However, not all natural sleep remedies are appropriate for babies, so it's important to speak with your baby's doctor before trying one. Look at your baby's diet to see if it might cause sleep issues. If you're a breastfeeding mom, your own diet can play a role in your baby's sleep. Caffeine can be passed on to your baby through your breast milk and too much caffeine is dangerous for babies. Breastfeeding moms should limit caffeine to 300 milligrams per day -- equal to about three cups of coffee -- according to the website Pregnancy.org. Keep in mind that caffeine is not just found in coffee and energy drinks, but may also be in sports drinks, tea and even chocolate. Sometimes spicy foods, dairy and sweets such as chocolate can make your baby fussy or gassy and cause sleep issues. Also, make sure your baby is eating enough during the day. Young babies will wake in the night for feedings, but older babies may sleep for longer stretches when put to bed with a full belly. If your baby is over 6 months, you could even try giving her a tablespoon or two of cereal right before bedtime, suggests the Ask Dr. Sears website. 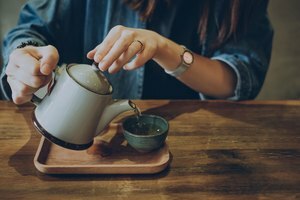 Alternatively, you could make some chamomile tea and feed it to your baby in her bottle, after the tea is cooled to room temperature, but always consult with your pediatrician before trying this method. 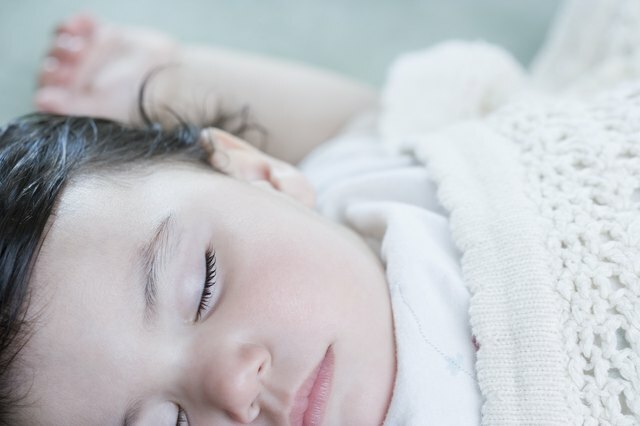 A homeopathic sleep aid for your baby may help with irritability and restlessness, suggests the American Association of Naturopathic Physicians' website. You could make an herbal sleep sachet filled with lemon balm, rosebuds, loose hops, lavender flowers and chamomile flowers, and place it under your baby's fitted sheet when you put him to bed. You could also try some lavender aromatherapy to help your baby sleep; apply some lavender oil onto your baby's crib sheet or mix a few drop of lavender oil with a few drops each of Peace & Calming oil and cedarwood oil and place this mixture into a diffuser. These essential oils can also be diluted in coconut oil, which can be applied to the back of your baby's neck, bottoms of his feet and behind his ears, advises the Dr.Greene.com website, but always check with your baby's doctor before applying anything to his skin. Ensure that your baby has a peaceful, non-stimulating place to sleep at night. Place your baby's bed in her own room or in your room, but keep her in her own bed. Use a firm crib mattress with only a fitted sheet on it, recommends the National Institutes of Health website. Dress your baby in a sleeper or wearable blanket, but do not cover her with a blanket. The temperature in your baby's room should be kept at the same temperature that's comfortable to you. At night, encourage the rest of the family to keep noise at a minimum to avoid waking your baby. A relaxing bedtime routine can help your baby wind down and prepare for slumber. Start with a warm bath to which you've added a few drops of lavender or chamomile oil. After bath time, give her a soothing massage to relax her even more. You can use some almond oil with a drop of orange or lavender essential oil, notes the American Association of Naturopathic Physicians' website. Diaper her and get her into a comfortable pair of pajamas. Feed her a bottle or allow her to nurse once more before bed. Read a story or sing a lullaby to her. Finally, place into her bed when she's looking drowsy but still awake, tell her good night and leave the room quietly. Pregnancy.org: Caffeine Could Be Keeping Your Baby Up All Night!